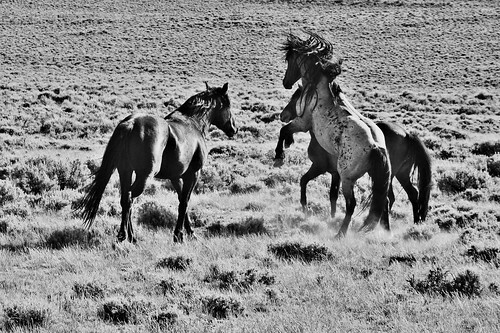 Currently viewing the tag: "Great Divide Basin"
They are a symbol of the Wild American West: free, passionate, violent and relentless in their beauty. They are also called pests. Diseased. Nuisances. Worthless. 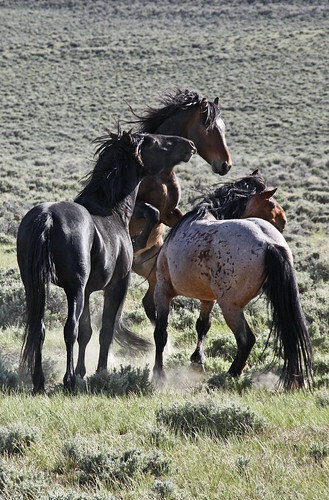 Wild mustangs often find themselves caught in between the battles of ranchers and conservationists, horse lovers and land managers. 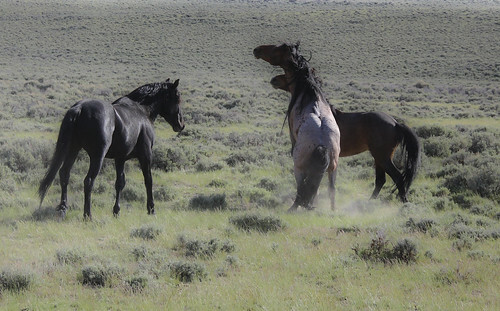 They graze on land that cattle companies want for themselves; they destroy precious wetlands in the high deserts of Wyoming and Nevada. 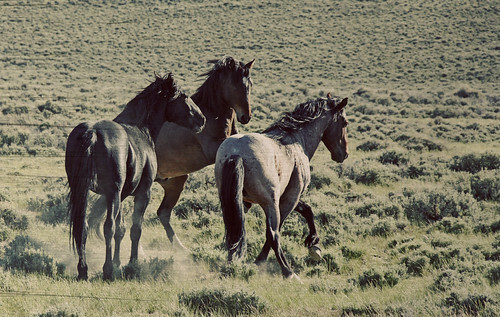 Almost 33,000 of these animals roams the plains of the American West, with another 34,000 of them in Bureau of Land Management holding facilities, awaiting news of their fate. 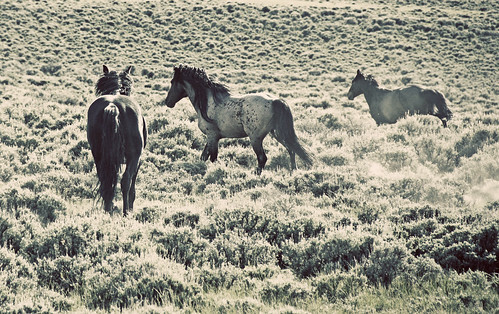 These horses, descendants of Iberian breeds brought from Europe, are hardy and rough around the edges. 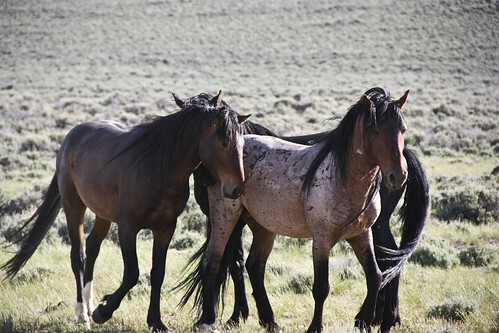 Many horse enthusiasts consider them mongrels, mutts, impure. Others consider them to be indestructible in their physical prowess and unwavering in their loyalty, should one be lucky enough to earn it. 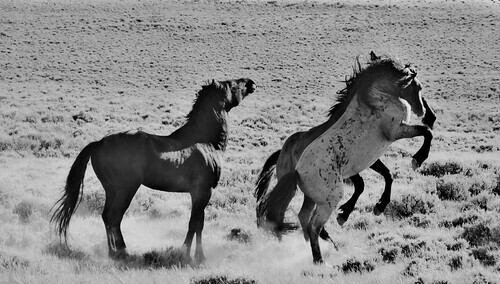 But there are few animals that can inspire such feelings of joy and freedom as the mustang. 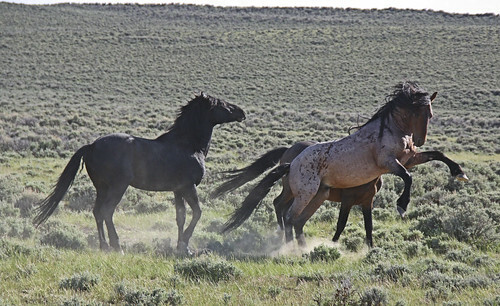 More so than the bison or pronghorn or golden eagles, horses take full advantage of the endless grasslands and sloping hills and brief, fierce rain showers of the Wyoming desert. They play and fight and run and roll through the mud and leave nothing left undone, just in case. 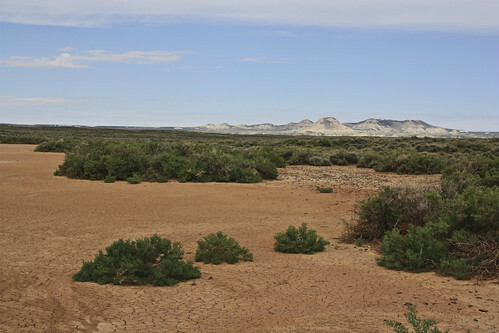 In a lonely corner of the Red Desert flow the Killpecker Sand Dunes, aptly named for the unfortunate effects the brackish water can have on…. ahem. Right. 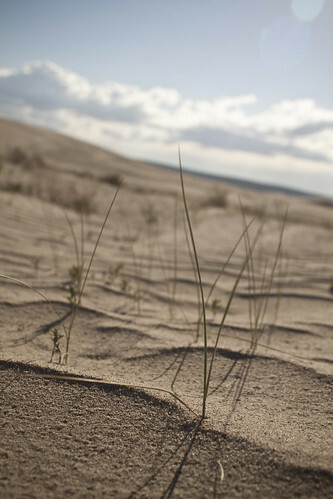 Despite the intimidating name, the sand dunes themselves hide a dry tenderness that only the desert can extend. 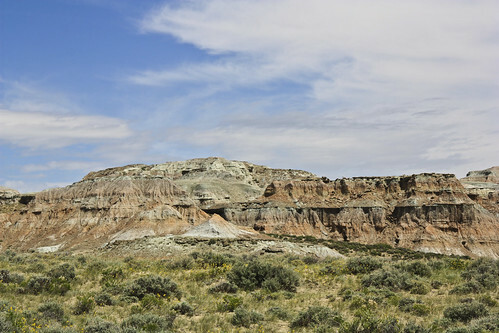 Crevices in the sand are filled with ponds and young, green plants with enough audacity to face the long summer head on. 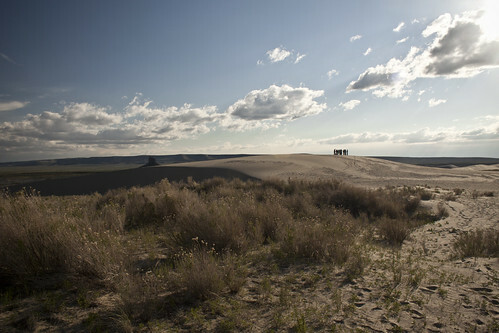 The evanescent sand castles hide the scars of oil and gas and agriculture and ancient battles. 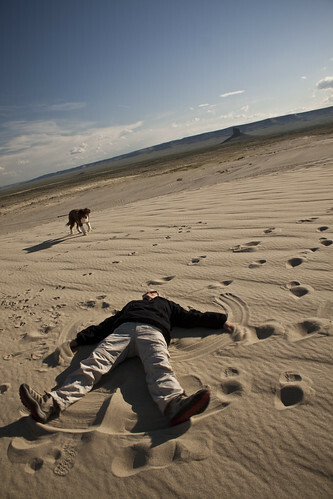 Local adventurer John Mionczynski takes us from mountain to dune to butte to plain, pointing out fossils and burial sites and places that simply make him stop and breathe. He knows this area inside and out and tells us stories of crocodile heads the size of truck beds and mummies and encounters with the ghosts of cowboys. 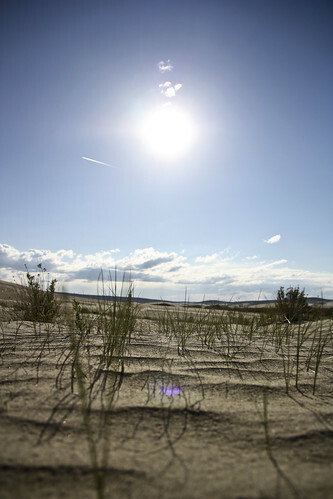 … to the tiniest blade of grass that pushes through thousands of years of scarcity. Nothing is left unwondered. Not even the mystery of the sand angel. 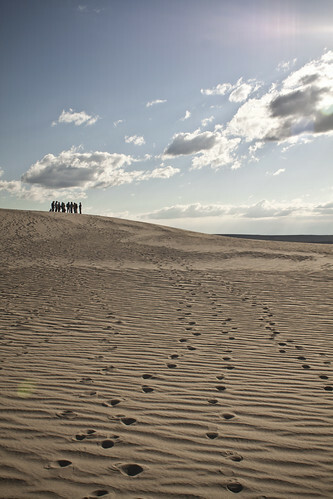 As the largest active sand dunes in the United States, Killpecker has a lot to account for. Lost campers, mountainous reserves of fuels, free play areas sprinkled with ATVs. The bodies of prehistoric warriors and the lost souls of pioneers. You could set up your tent at dusk one night only to wake up and find the entire desert has changed entirely, right underneath you, when the sun rises. 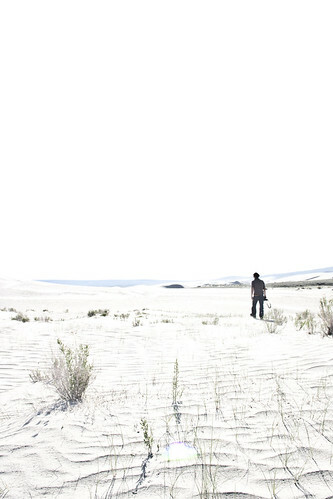 It’s easy to feel alone out here, utterly desolate and lost. 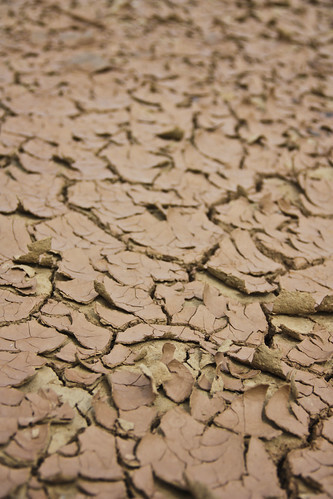 The sun parches the land of sweat, and only the brine of salty earth remains. 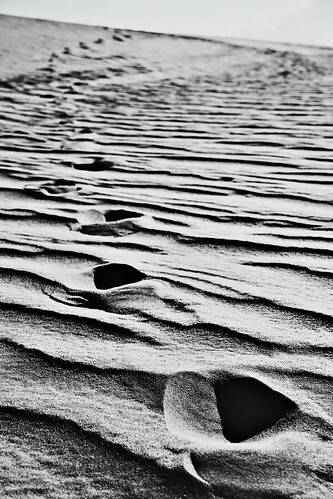 Footsteps are soon swept away in a monsoon of Wyoming winds. 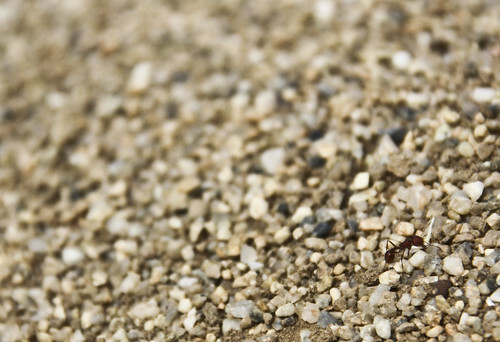 You head into the dunes alone, your camera your only goal, and hope to find… what? To find you? And there’s nothing left, but nothing. Mud, Mud, everywhere, and not a fancy mud-spa in sight. 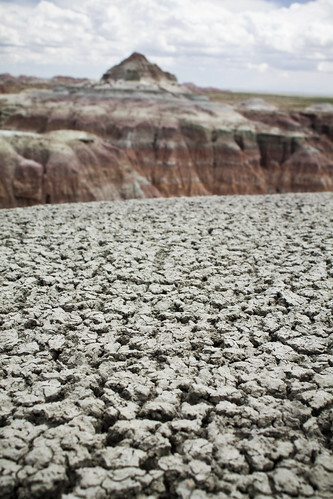 The earth of the Red Desert cracks and shatters and mazes its way around sagebrush and highways. What only a couple of days ago were open lakes and lush wetlands have withered into stark arrays of extinct creek beds and sea floors. 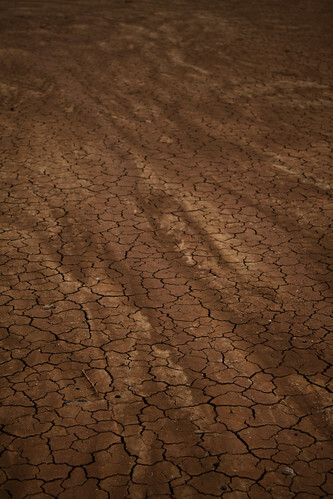 With the passing of the heavy winter snows, rock slides and washouts and flash floods have destroyed evidence of human invasion, the highways and industry roads that spiderweb their way across the endless stretches of nothing. Our feet leave only ephemeral footprints in the dusty red of the crumbling mud ponds, and we keep our eyes open for the white pelicans the spring flats are so famous for. 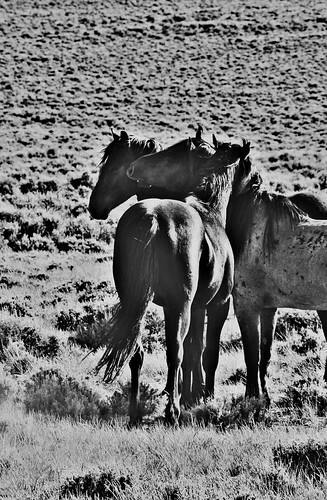 Worn and splintered, the deserted waterways wind around sagebrush and abandoned cars, making temporary paths for big and small, pronghorn and tiny ant alike. In the distance, the Red Desert dips into valleys and rises into the mountain beyond. 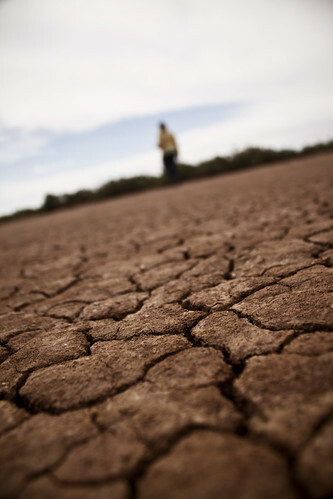 It’s full of empty spaces, the Great Divide Basin, and even the oil and gas development present in regular intervals fails to ugly the scenery as we walk along the mudflats. 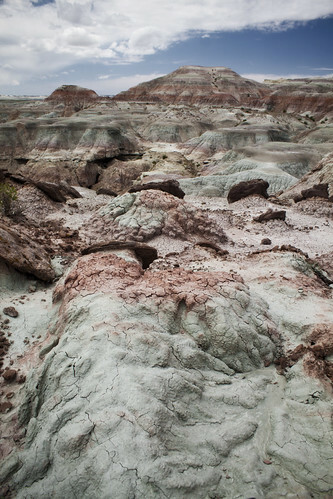 Looking for some badlands free of the restrictions of the National Park Service and far from other wayward tourists? Head to Wyoming for some not-to-miss scenery, and you may be the only person for 100 miles to witness the harsh beauty of the wild place. 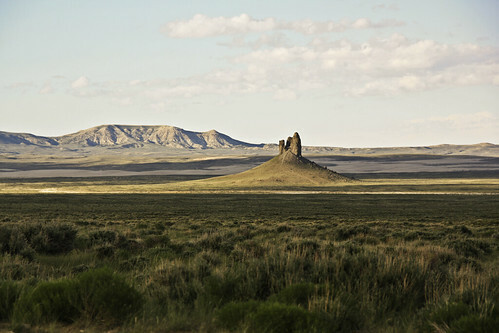 Wyoming’s Red Desert is smack in the middle of the Great Divide Basin, where water drains neither to the Pacific nor the Atlantic and instead gathers and stagnates in one of the largest unfenced stretch of pasture land in the country, settled in between Rock Springs, Farson and South Pass City. 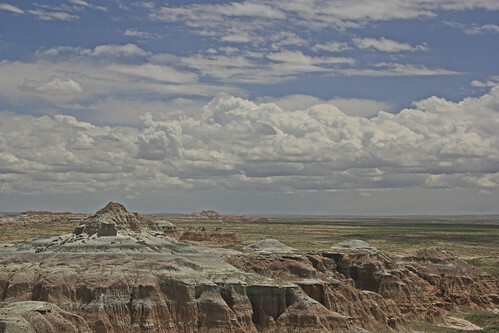 Even on holiday weekends, you may be the only person you see in these less-popular but no less-spectacular version of Badlands. While as much as 84% of the Red Desert has been industrialized by the oil and gas companies, it’s easy to find your own private desert cove to relax in. 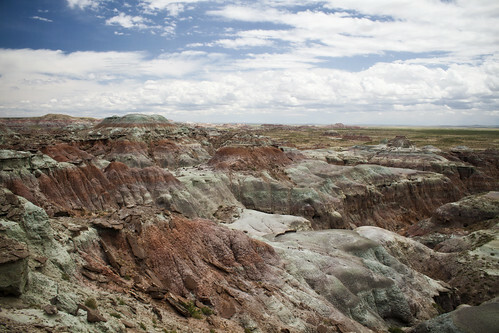 And despite the stretches of thick, sandy desert, these badlands are home to myriad wildlife, including seasonal wetland birds, pronghorn, rare desert elk and wild horses. 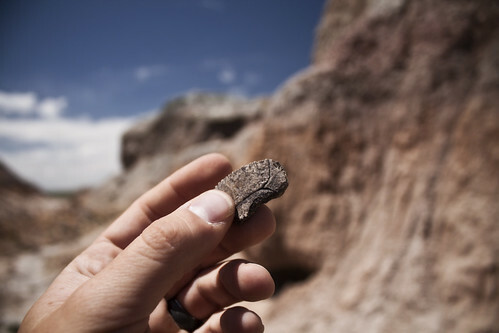 Fossils litter the ground, largely turtles and other ancient reptiles, and it was the perfect place for Jonmikel to find his very first fossil! Stone turtle shells speckle the cracked earth as abundantly as needles in a pine forest, and they crinkle and crack underfoot and turn to dust. 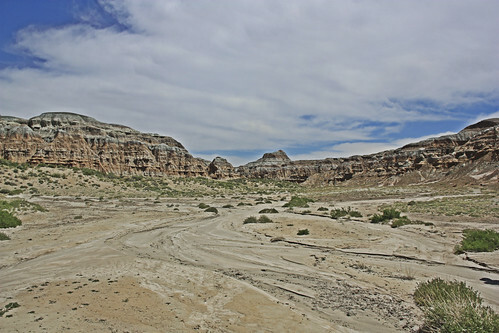 As this area is largely managed, so to speak, by the Bureau of Land Management, you are free to roam and camp where you like, but beware that if you are lucky enough to see one of the rare rainfalls, you could get washed out and stuck in the sand before you even hear the waters coming. The cultural landscape of the Red Desert is hidden just below the surface, with petroglyphs dating back almost 12,000 years dotting any solid rock surface. 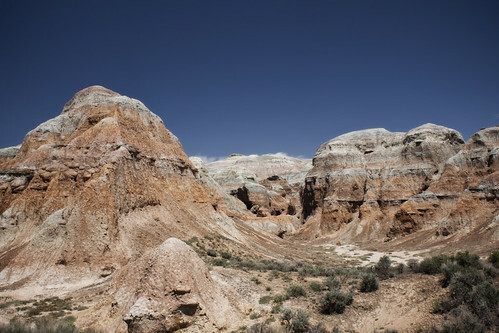 But people, it seems, have always been fascinated by this arid basin and it’s seas of red sandstone and shifting dunes. Human remains are tucked into corners with bison bones and artifacts, a testament to this veritable crossroads of Plains warriors. 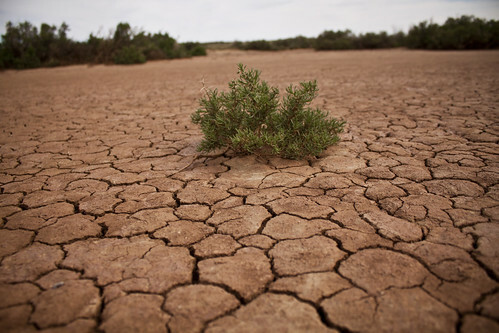 When the settlers came, only to discover that the rains would most certainly not follow, they explored the desert for any advantage they could find. 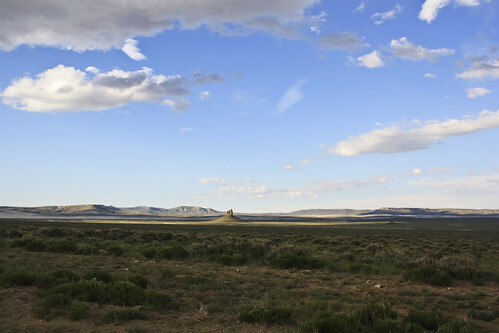 Wagon roads, rail roads and evidence of gold are buried under the ever-changing landscape, and everyone from BP to Annie Proulx to The Nature Conservancy and the National Wildlife Federation have a stake in the future of the Red Desert.